Description: Restrictions apply on ammunition orders, please read this entire ad carefully before bidding or offering to buy. This listing is for TEN Boxes, a total of 500 cartridges or rounds. Order 5 or more boxes of any Centerfire rifle or pistol ammunition we have and get free shipping. . In less than a decade, Wolf Performance Ammunition has gained a good reputation for its performance as inexpensive ammo. Manufacturer and warrantor is Tula Cartridge Factory in Russia, just south of Moscow. Importer is Wolf Precision Ammunition of Placentia, CA. This is Wolf's Standard 9mm load, an excellent load, with 115 grain lead core Full Metal Case bullets loaded in brass-plated steel cases. Locally, our Berettas, Smith & Wessons and Rugers have digested this ammo flawlessly, but we cannot say the same for the pricier, more finicky Sigs and Glocks. Rated at 1125 feet per second from a 5 inch Beretta, this round develops an impressive 352 foot pounds of muzzle energy. It is thoroughly clean and clean-burning non-corrosive ammunition. Note the laquer coating on the primers. This is universal for Russian centerfire ammunition, and it enhances the already-long ammunition storage life. We're offering this ammunition in its factory case of 10 Boxes at only $9.90 per box. 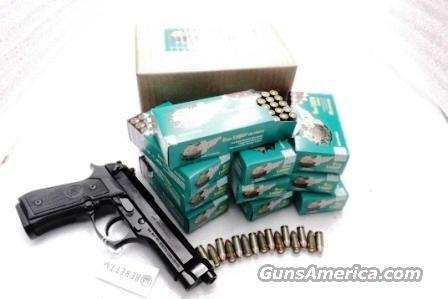 Own a 500 round case for only $99.00 Shipped to the lower 48. >>>>>>>>>>>>>>>>> No Returns on Ammunition. Bids and offers to buy must be for the registered user only. Don’t buy for your buddies, that kind of thing smells like a felony level straw purchase attempt for guns or ammunition. Magazines and any small light non-gun items ride free with ammo orders. GA Pay, MasterCard/Visa/USPS Money Order paid orders shipped ASAP. 14 day hold on checks. Signed ammo statement and legible photo ID copy required for shipment to non-dealer civilians, see the form among this ad’s photos. Illinois residents must provide a FOID card copy too. May be faxed or scanned and emailed. We cannot ship ammunition and 30 shot magazines to civilians in Alaska, Aurora IL, California, Chicago IL, Colorado, Connecticut, District of Colombia, Hawaii, Maryland, Massachusetts, New Jersey, New York, Puerto Rico, or South Bend IN. Please e-mail statement to james @ robertsontradingpost com , fax to 731 989 4723, or mail to Robertson Trading Post/PO BOX 365/Henderson TN 38340. We have an ammunition statement form included in this listing’s photographs. For best results on ammo, 2 page fax with ammo statement & light copy photo ID on the first page, and 5 digit GA Pay number, or MC Visa or Discover on 2nd page with quantity and number desired. We always shred card info.